The Samsung Galaxy M30 is the third M series smartphone from the company and is expected to launch later this month. The phone recently received approval from the FCC, which means that the launch day is nearing. Now, news agency IANS is reporting that the Samsung Galaxy M30 price in India will be Rs 14,990 for the base variant. It is also reporting that the phone will go on sale in the first week of March, which is only a few weeks away. The IANS report also tipped a few key features of the Galaxy M30. It claims the smartphone will be powered by the Exynos 7904 processor, have a Super AMOLED Infinity V screen, triple rear cameras, and 5,000mAh battery. While the 4GB + 64GB variant will be part of the lineup, one variant is said to have 6GB RAM and 128GB internal storage. 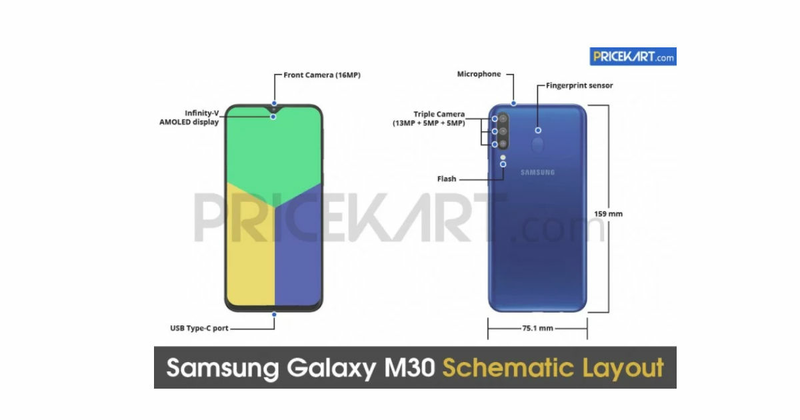 The Samsung Galaxy M30 will be latest edition to join the new line-up and it will most likely cause a lot of mayhem. The phone is said to feature a 6.38-inch full HD+ Super AMOLED display and include a massive 5,000mAh battery. The display will sport a tiny notch at the top, which would house a 16-megapixel sensor. We pretty much know all the details of this phone, but do not have an exact launch date. Nevertheless, with a starting price of Rs 14,990, we are sure that a lot of people would be interested in buying the Galaxy M30. The device will also feature a triple-rear camera setup, something that is not yet seen in the budget smartphone segment. The price of the phone could go up to Rs 18,000 or more, based on the RAM and storage configuration. Samsung recently launched the Galaxy M10 (review) and Galaxy M20 (review) in India, both of which are budget smartphones aimed at the youth. These India-first phones have large displays with tiny waterdrop-style notches and big batteries. The Galaxy M30 is also said to be similarly feature packed and will compete with other phones such as the Realme 2 Pro, Xiaomi Redmi 6 Pro, Honor 8X, etc. Samsung is selling the phones on Amazon India and its own online store.